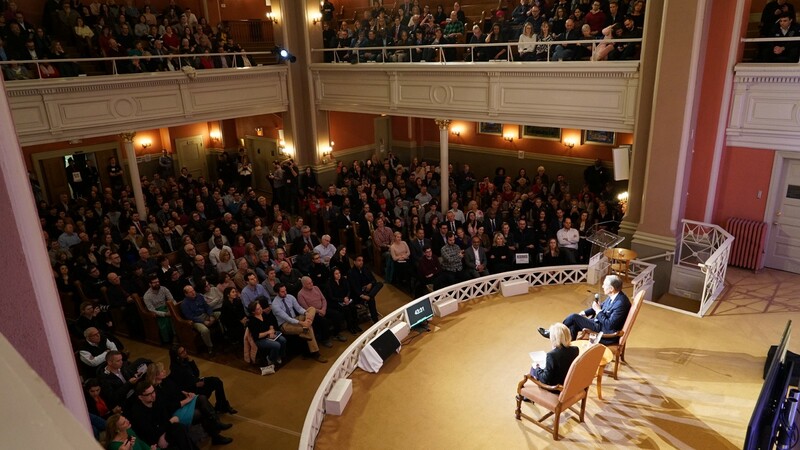 In conversation with Doris Kearns Goodwin, Sixth & I, Washington D.C., February 14, 2019. It’s been three weeks since we began this journey with the launch of my new book on 60 Minutes and the announcement that I am seriously considering running for president as a centrist independent. The reaction has been beyond any expectation I had. Thank you for supporting the book — which is at #3 on Sunday’s New York Times hardcover nonfiction bestseller list — and for the outpouring of interest and support you are demonstrating. Thousands of Americans have reached out — people who want common-sense solutions to the problems we face, people who are frustrated with our broken two-party system, people who want to hear the truth from their leaders, and people among the exhausted majority of Americans who want genuine leadership and cooperation in Washington. They all are seeking to renew the true promise of America. As I’m sure you’ve seen, there have been some skeptical and even downright angry comments from party activists and inside-the-Beltway pundits in the press and on social media. Others have expressed genuine fears that an independent candidate could help re-elect President Trump. I hear and respect this overriding concern, and have repeatedly promised that I will not be a spoiler. I am committed to ensuring that I will do nothing to re-elect Donald Trump. I mean it. In the meantime, I will continue to reach out to Americans who are critical or unsure about an independent candidacy. I have come to feel a deep responsibility and moral obligation to address Americans’ frustrations with our broken two-party system. Forty-five percent of Americans don’t feel well represented by either party. They come from both liberal and conservative points of view, and a substantial number of them simply don’t vote — about 100 million people sat out the 2016 election — or hold their nose and vote for the least-worst option. They deserve a better choice. So, too, do the tens of millions of Americans who don’t live in swing states. Everyone’s vote deserves to count, and they will with a credible, centrist independent on the ballot in all 50 states. I also believe critics are ignoring, or failing to acknowledge, the degree to which our two-party system is failing the American people. Polling consistently shows that more than 60 percent of respondents believe our two-party system is broken and that it’s time for a centrist candidate who is unaffiliated with either party to be president. To be very clear, I firmly believe there is an unprecedented appetite for a centrist independent presidential candidate, and that there is a credible path for an independent to win more than the necessary 270 electoral votes — a key criteria in my consideration of whether to run. I’ve spoken about how the far right and the far left are holding our government hostage by engaging in revenge politics and preventing sensible solutions to big challenges, such as health care and immigration. The last few days have brought us two more stark examples of the cost of extreme ideologies. The president recklessly declared a national emergency so he can raid the budget for our military to start construction on his foolish and unnecessary border wall. Meanwhile, far-left activists succeeded in forcing Amazon to abandon plans to create a second headquarters in the New York City area, which would have brought 25,000 jobs and injected billions of dollars into the local economy. Where has common sense gone? At each of my public events, I’ve posed a rhetorical question: “What kind of country do we want to live in?” Is this the America we want — not just for us, but for our children and grandchildren. I am also excited by the reception that From the Ground Up has received. People are reading my story and getting to know me in a way much of the media coverage about me has ignored. I’ve had the honor of speaking before packed crowds in New York City, Chicago, Boston, Seattle, Phoenix, Philadelphia and Washington, D.C. over the past three weeks, and this week brings sold-out events in San Francisco and Los Angeles. In the coming weeks, I will lay out my vision for how a centrist independent would govern. I will discuss how we must draw upon the best ideas from all sides, reject revenge politics and assemble an administration that reflects the full diversity of the country, including Democrats, Republicans and independents. I will also share more details about how a centrist independent would address major public policy challenges. Please share this message with your friends who want to dismiss the idea of a third choice. To the activists and political party surrogates who aim to silence me, or miscast my intentions, I’m going to have an honest conversation with the American people about how we can find common ground and address the crisis of governance facing our country. I’m excited to keep the conversation going, and to spend the coming weeks and months traveling our great country, stopping in places large and small, to listen to — and learn from — the American people. My path forward will not be based on partisans or pundits. I will be most influenced by what I see and hear from my fellow citizens across the country. I want to listen to those whose voices have been drowned out or ignored for far too long. As we go on this journey, I promise to keep an open mind, learn and improve, stay in touch, and share what’s happening along the way. We have started a conversation, and it is critically important.